Philosopher Lee McIntyre has written a very interesting new book called Respecting truth: willful ignorance in the Internet age. If you liked my article On the importance of evaluating truth claims and my little tool for evaluating truth claims, you must also like this book. In the book, Lee McIntyre argues that our relationship with truth is complex. On the one hand we often live our lives as if we believe that truth exists. On the other hand many of us are often willfully ignorant. What this means is that we refuse to consider evidence which contradicts our beliefs because we don't want to abandon those beliefs. McIntyre says that ignorance or false beliefs aren't what is dangerous but the choice to remain ignorant by insulating ourselves from new ideas or evidence. He discusses in detail topics likes religion (which he compares to a conspiracy theory), American politics (which has become much more biased against science, in particular on the Republican side), media (in which the ideal of objectivity is become scarce), and science (in which the post-modernistic doubt whether truth actually exists has, unfortunately, become rather influential). 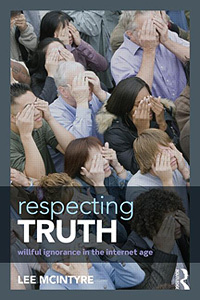 McIntyre argues that respecting truth may be uncomfortable but will be beneficial for us. To quote him: "Progress in human civilization has always been marked by openness to truth." He says that respecting truth does not only mean that we are be open and prepared to break out of our certainties but also that we defend the general idea of respecting truth.